#1. This week's number one is former U18 international center Youssoupha Fall (221-95, currently plays in France). Fall could not help SIG Strasbourg (8-7) in their last game. Despite his good performance SIG Strasbourg was crushed 80-55 on the road by the higher-ranked (#6) JDA Dijon. Fall was the top scorer with 13 points. He also added 9 rebounds in 27 minutes on the court. It's Fall's first season with the team. Fall has individually a very good year with high stats. He averages: 16.3ppg, 8.4rpg, 1.4bpg, 2FGP: 70.2%(85-121) and FT: 59.5% in 12 games he played so far. Fall played for the Senegalese U18 national team seven years ago. #2. 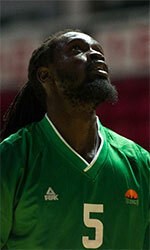 Second place goes to an international forward Maurice Ndour (206-92, college: Ohio, currently plays in EuroCup). He led his Russian team Unics Kazan to an easy victory against the fourth-ranked Cedevita (0-3) crushing them 105-70 in the Eurocup in Wednesday night's game. Ndour scored 13 points, had 4 rebounds and made 3 blocks. Unics Kazan (2-1) is placed second in group H. There are only three games left until the end of the Eurocup Top 16. So now every game will be critical. Ndour has relatively good stats this season: 10.9ppg, 4.5rpg, 1.2bpg, 1.1spg, 2FGP: 53.9% and FT: 87.5%. He is in the roster of the Senegalese senior national team. #3. The Senegalese player who performed third best last week abroad was an international center Youssou Ndoye (213-91, college: St.Bonaventure, currently plays in France). Ndoye led JL Bourg to a victory against the 13th-ranked Le Mans (6-10) 83-77 in the French ProA last Saturday. He recorded 17 points and grabbed 9 rebounds (made all of his five free throws) in 36 minutes. JL Bourg Basket (13-3) is placed second in the ProA. Ndoye has very impressive stats this year: 15.7ppg, 9.1rpg, 1.8bpg, 2FGP: 65.7%(94-143), 3FGP: 33.3% and FT: 72.1% in 15 games. He is also a member of the Senegalese senior national team. #4. An experienced forward Mouhammad Faye (207-85, college: SMU, currently plays in EuroCup) was not able to help Crvena Zvezda in their game against Valencia Basket (3-0) in the Eurocup. Faye scored 9 points and grabbed 5 rebounds in 23 minutes. But the third-placed Crvena Zvezda (1-2) was badly defeated 92-76 in Valencia by the leading Basket in the group G of Eurocup. There are only three games left until the end of the Eurocup Top 16. So now every game is very crucial. This year Faye's overall stats are: 8.7ppg, 7.3rpg and 1.6apg in 10 games. He is also Senegalese national team player. #5. Former international center Moussa Diagne (211-94, currently plays in EuroCup) contributed to Andorra's victory against the third-ranked Zenit (1-2) 80-71 in the Eurocup last Tuesday. He scored 10 points, had 5 rebounds and made 2 blocks. MoraBanc Andorra (3-0) is placed first in group H. So far his team won all three games in the Top 16. There are only three games left until the end of the Eurocup Top 16. So now every game will be important. Diagne's total stats this season are: 6.9ppg and 5.0rpg. He has a dual citizenship: Senegalese and Spanish. Worth to mention Diagne played also at Eurobasket Summer League, which helped him get the job in pro basketball. Diagne used to play for the Senegalese national team three years ago. #6. Power forward Babacar Toure (205-85, currently plays in Basketball Champions League) led his Swiss team Fribourg to a victory over the closely-ranked Telekom Baskets (4-7) 70-63 in the Basketball Champions League on Tuesday night. He was MVP of the game. Toure had a double-double by scoring 21 points and getting 12 rebounds in 31 minutes. Fribourg Olympic (3-8) is placed seventh in group B. They ended the series of six consecutive loses. There are only three games left until the end of the Basketball Champions League Regular Season. Toure has very impressive stats this year: 16.1ppg, 10.8rpg and 2.5apg in 16 games. He is a former international player as he played for the Senegalese senior team five years ago. #7. Former international power forward Ibrahima Faye (207-97, currently plays in Belgium) was the main contributor in a Leuven Bears' victory against the closely-ranked Kangoeroes (4-9) 92-75 in the Belgian Euromillions League in Saturday night's game. Faye was the best player in that game. He recorded a double-double by scoring 23 points and getting 12 rebounds. Stella Artois Leuven Bears (3-8) is placed second from the bottom (#9) in the Euromillions League. It was Leuven Bears' first victory after four consecutive loses. But this is still an early stage of the season and everything may happen. This year Faye has relatively solid stats: 11.8ppg, 9.9rpg, 1.3apg and 1.1bpg. He used to play for the Senegalese national team three years ago. #8. Center Cheikh Mbodj (208-87, agency: Octagon Europe, college: Cincinnati, currently plays in Poland) contributed to a 3-point Twarde Pierniki's victory against the tenth-ranked Wilki Morskie (6-9) 98-95 in the Polish EBL last Sunday. Mbodj scored 8 points and grabbed 6 rebounds in 30 minutes. Polski Cukier Torun (13-3) is placed first in the EBL. It was his team's fourth consecutive victory in a row. Mbodj has reliable stats this year: 12.1ppg, 6.3rpg, 1.4apg and 1.9bpg in 16 games. He plays currently for the Senegalese national team. #9. International center Gorgui Dieng (211-90, college: Louisville, currently plays in NBA) was not able to secure a victory for the Minnesota Timberwolves (21-24) in their game against the Philadelphia 76ers (30-16) in the NBA. Dieng scored 7 points and grabbed 9 rebounds in 20 minutes. The Minnesota Timberwolves (21-24) were crushed 149-107 in Philadelphia by the 76ers. Dieng has been at the team for six years. This season his total stats are: 5.5ppg and 4.1rpg in 45 games. Dieng is also in the roster of the Senegalese national team. #10. Power forward Jules Aw (202-86, currently plays in Switzerland) couldn't help Massagno (8-2) in their game against Neuchatel (9-5) in the Swiss SBL. Despite his very good performance in Saturday night's game He was the top scorer with 17 points. Aw also added 6 rebounds. This season Aw has very high stats. He averages: 17.4ppg, 10.6rpg, 1.4apg and 2.1spg. Aw is a former international player as twelve years ago he still played for the Senegalese senior national team. #11. U18 international center Biram Faye (206-0, currently plays in Spain) couldn't help Fontedoso Carrefour in their game against Tormes in the Spanish LEB Silver (third division). Despite his very good performance on Friday night Faye recorded a double-double by scoring 19 points and getting 14 rebounds. He also added 2 blocks. Faye averaged so far 11.2ppg, 8.3rpg and 1.3bpg. He plays currently for the Senegalese U18 national team. #12. Former international center Pape Faye (200-87, currently plays in Japan) couldn't help Osaka Evessa in their game against Kyoto Hannaryz in the Japanese B League. He scored 8 points. His team was defeated 67-58. Faye has averaged so far 8.7ppg, 5.6rpg and 1.2apg. He used to play for the Senegalese national team back in 2017. #13. Former U18 international power forward Cheikh Sane (207-92, college: Marshall, currently plays in Denmark) contributed to a Horsens IC's victory against the third-ranked Vaerlose 101-94 in the Danish BasketLigaen in Wednesday night's game. Sane recorded 6 points and grabbed 5 rebounds in 21 minutes. Sane has averaged so far 5.1ppg, 6.5rpg, 1.5apg and 1.6spg in eight games. He used to play for the Senegalese U18 national team eleven years ago. #14. Former U18 international power forward Ousmane Barro (207-84, college: Marquette, currently plays in Romania) couldn't help CS Dinamo Bucuresti in their game against CSM Steaua Bucuresti in the Romanian Liga Nationala, despite his very good performance in Sunday night's game. Barro had a double-double by scoring 13 points and getting 10 rebounds in 31 minutes. But his team lost 70-77. Barro's stats this year are: 14.7ppg, 8.7rpg and 1.7spg in three games. He used to play for the Senegalese U18 national team back in 2002. #15. U18 international center Amar Sylla (206-1, currently plays in Spain) couldn't help Real Madrid II in their game against Nautico Tenerife in the Spanish EBA (fourth division), despite his very good performance on Saturday night. Sylla had a double-double by scoring 17 points and getting 10 rebounds. He also added 3 blocks in 28 minutes. But his team was edged 84-82. Sylla averaged so far 14.0ppg, 8.6rpg and 1.5bpg in 15 games. He is also in the roster of the Senegalese U18 national team. #1. Ilimane Diop (210-C-95, currently plays in Euroleague) led his Spanish team Baskonia to an easy victory against the 14th-ranked Gran Canaria (6-13) 83-66 in the Euroleague in Friday night's game. He had a double-double by scoring 13 points and getting 10 rebounds. Diop also added 2 blocks in 27 minutes. 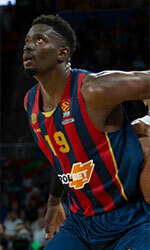 Kirolbet Baskonia Vitoria (9-10) is placed eighth in the Euroleague. It's Diop's sixth season with the team. This year he averages: 4.7ppg and 3.0rpg in 19 games he played so far. Diop has a dual citizenship: Senegalese and Spanish. #2. Amath M'Baye (206-F-89, college: Oklahoma, currently plays in Basketball Champions League) led his Italian team Virtus Bologna to a victory against the seventh-ranked BBC Bayreuth (4-7) 93-83 in the Basketball Champions League last Wednesday. He scored 15 points. Virtus Segafredo Bologna (9-2) is placed first in group D. It was his team's ninth consecutive victory in a row. There are only three games left until the end of the Basketball Champions League Regular Season. So now every game will be critical. M'Baye has relatively good stats this season: 11.2ppg, 3.3rpg and 1.6apg. He is another player who holds two passports: Senegalese and French. #3. Experienced Alioune Badara Ndoye (199-F-86, currently plays in Qatar) could not help Al Rayyan (1-9) in their last game on Saturday. Despite Ndoye's very good performance the bottom-ranked Al Rayyan was defeated 91-79 in a derby game by the leading Al Shamal. He was the top scorer with 22 points. Ndoye also added 9 rebounds and dished 7 assists. The Regular Season already ended. This season Ndoye has relatively solid stats: 14.0ppg, 8.3rpg, 3.0apg and 1.7spg. He has both Senegalese and Qatari nationalities. Despite Ndoye's Senegalese passport, he previously played for the Qatari military national team and is probably not eligible to play for the Senegalese team. #4. Mamadou Niang (209-C-94, currently plays in Basketball Champions League) was not able to help CB Canarias in their game against Umana Venezia (8-3) in the Basketball Champions League. Niang scored only 4 points. CB Canarias was edged 80-78 on the road by the second-ranked Umana Venezia in the group B of Basketball Champions League. There are only three games left until the end of the Basketball Champions League Regular Season. Niang has been at the team for four years. His total stats this season are: 5.2ppg and 3.0rpg. #5. Lamine Diane (201-F-97, currently plays college basketball in the States), who plays in the NCAA was not able to secure a victory for the CS Northridge in their last game on Thursday. Despite his very good performance his team was defeated 84-79 in Honolulu by the University of Hawaii. Diane recorded a double-double by scoring 28 points and getting 16 rebounds. Diane has individually a very good season with high stats. He averages: 24.1ppg, 11.4rpg, 2.1apg, 2.3bpg and 1.6spg. #6. Oumar Seck (208-C-88, currently plays in Qatar) led Al Arabi to a victory over the closely-ranked Al Gharafa crushing them 87-66 in a derby game in the Qatari D1 on Wednesday night. Seck was the top player that evening. He had a double-double by scoring 28 points and getting 11 rebounds. Seck also added 6 assists and 3 blocks in 37 minutes. Seck has very impressive stats this year: 19.3ppg, 11.5rpg, 2.1apg and 1.1bpg in eight games. #7. Mame Souleye (206-C-87, currently plays in Qatar) contributed to an Al Wakrah's victory against the closely-ranked Al Ahli 73-68 in the Qatari D1 last Wednesday. He scored 12 points, had 8 rebounds and dished 3 assists in 30 minutes. Souleye's stats this year are: 13.5ppg, 10.5rpg and 1.5apg in four games. He also holds two passports: Senegalese and Qatari. #8. Bira Seck (204-PF-90, agency: Interperformances, college: Idaho, currently plays in Japan) was the major contributor in a Tokyo Cinq Reves' victory against the closely-ranked Gifu Swoops 75-69 in the Japanese B League D3 in Saturday night's game. Seck had a double-double by scoring 13 points and getting 14 rebounds. He also added 2 blocks in 30 minutes. Seck's stats this year are: 14.4ppg, 8.2rpg and 2.0apg in 30 games. #9. Abdou Thiam (204-F/C-98, currently plays in Spain) was the main contributor in Betanzos' surprising victory against the fifth-ranked Chantada 78-74 in the Spanish EBA (fourth division) last Sunday. He was the top player that evening. Thiam recorded a double-double by scoring 18 points and getting 25 rebounds. He also added 2 blocks. This season Thiam has very high stats. He averages: 19.8ppg, 16.1rpg, 1.7bpg and 1.3spg. #10. Atoumane Diagne (215-C-98, currently plays in Spain) couldn't help Barca II (5-13) in their last game. Despite Diagne's good performance Barca II was crushed 70-49 on the opponent's court by the higher-ranked (#15) Caceres_Basket. He was the top scorer with 10 points. Diagne also added 9 rebounds and made 4 blocks in 20 minutes. Diagne has averaged so far 7.9ppg, 6.8rpg and 1.7bpg in 18 games.